Ubuntu, Now More Popular than Windows XP! These statistics from Google Trends are another solid proof that Ubuntu is key to Linux mainstream adoption. Let’s just hope that majority of those who searched for “Ubuntu” in Google were actually using Linux or would end up using Linux for good. Great. Linux is more famous than an operating system from 2001. More people google for HELP when using Ubuntu than when using Windows. Glad to see this but I'm not convinced. Search frequency does not equate to popularity. I would guess that Linux users probably do more searching. On the other hand, the patterns do follow release cycles. You've prefixed the M$ search terms with "windows". Additional terms mean tighter constraints which means lower search frequency. By contrast a similar chart for ubuntu, xp, vista tells a different story. The reassuring thing is that the M$ products have stagnated in search whereas ubuntu is going from strength-to-strength! Actually the most likely reason more people are searching for ubuntu is because they need more help making it work than they do for Windows XP. When I tried ubuntu I spent hours searching Google and message boards trying to get my networking going with it. XP is pretty much install, update and forget where as ubuntu takes a lot more tinkering. People just search Windows and not Windows XP. Compare linux and windows terms and you will see different trends. The number of people looking for Ubuntu-related help == The number of people that are using Ubuntu. This is good for Ubuntu and Linux I guess. People, we are talking about "search popularity" here, therefore look at the data and see the downward spiral of Windows products and compare those with Ubuntu which has been steadily climbing up. This only means that more and more people are noticing Linux particularly Ubuntu so this is all good. Yes but Google Trends never was a 100% accurate system to compare this stuff. Try searches after ubuntu, windows or ubuntu, vista or jaunty, vista and the results will differ. Nice statistics. The interpretation is a major fail though. Try Ubuntu and Windows, or Linux, Windows. Being more popular for Google search may also mean that there are simply more people having problems with Ubuntu than they are with Vista or XP. I would read that as a bad thing !!. 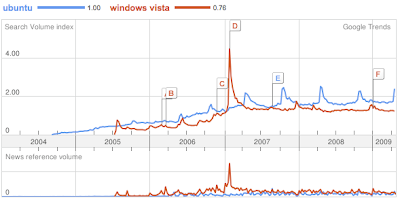 And people are **NOT** having trouble with Vista or XP therefore they are not doing searches for them. I am a passionate Linux fan but the interpretation of this data is nothing short of ridiculous. The only conclusion that one can draw is that Linux is getting a higher and higher profile every day. In absolute terms Windows and Linux are not comparable. YET! If you look at the trend for search key 'linux' you would get a worrying descent of 'popularity'. But that can be explained by the fact that people use the distribution's name when referring to Linux. So Google trends are what they are. About search. Don't extrapolate them to real life. Honestly I agree with the person above that said that Ubuntu gets more hits because people are looking for help on how to do something, not because it is more popular. Also, you incorrectly used the word 'loosing'. The word is losing. That's why if u get the same amount of users M$ and Linux u r going to see the linux user using alot more the web to do all kind of things....compare to the same amount of M$ user. more searches for Ubuntu means more users interested/using Ubuntu. More Ubuntu users probably also means more problems thus more google searches. is really never had so many hits a day! in linux this is a big change ..
Are you kidding me. And to those we think that there are more searches for ubuntu because more people are having problems with ubuntu would not be backed by statistics. windows is so much more popular than linux and if only 1% of the windows users search for windows xp it would surpass all ubuntu searches by a big margin. and lastly which windows user didn't encounter problems with windows. I'd guess a lot of windows users don't even include their OS as a search term when they look for help. Typically if you're doing a problem solving search, answers relevant to windows will come way above those for any other OS, so you don't need to mention it. The one time I would include a Win OS name in search would be when I'd switched versions and suspected a fault might be linked to the upgrade. In my experience, a lot of Windows users don't even know what an OS is*. For perhaps the majority of home users, and even some office admins, your OS, desktop environment, and many common apps like browsers and productiviy software are just what comes with the PC when you buy it. That's possibly a bigger challenge for spreading Linux adoption, than arguing the benefits of switching. If you're the sort of user who buys hardware, and then considers which OS is best for your system and use, you probably know a fair bit about alternative OSes already. Most users don't even get that far. *I'm thinking specifically of my mum here, who only recently got to grips with the idea that a browser was a specific app, with competitors available, after a decade or so of using a PC at home. In all that time of providing unofficial IT support, I'd never considered that she hadn't realised that her AOL browser wasn't the only way to access the internet. i never wanted to try linux but i'm gettin ubuntu right now because of a failed-install-leftover-files from windows 7 that i have not rights to delete. Another difference, apart from the fact that more people are likely to be googling for help with ubuntu is the fact that to find out about networks in xp, you could search for "network" but to get relevant information for networks in ubuntu you would have to search for "network+ubuntu" because using ubuntu is not the most popular. Rather encouraging that a lot of people are using google to solve problems though. Friends my 2 cents. Any Windows OS (XP,2K,Vista....) everybody knows that is pathetic, painful and has millions of bugs in it. Only good part of windows is ...user friendly. But now that the ubuntu has shown that Linux is also capable of giving user friendly commands with less prolems compared to windows people are having and thought. I agree that setting up devices and internet is not easy like windows. But once done...done for long long time. Windows always has to be reinstalled, defraged,etctectetc...I am sick of windows...I respect the people behing Ubuntu to serve community with humanity in mind. Love Ubuntu, will srtay with it now, Dropped Microsoft due to leasing agreement nonesense and poor operation - No more blue screens of Death Thank God!, and the upgrades are improvements on the same theme, not radical re-makes of failure like Vists was! And Ubuntu users cannot do anything but asking google for little help. Yea I like 9.10 a lot. Wine still needs work but WoW seems to be installing fine. I was shocked when I installed Opera 10 simply by clicking on the link. What a load of bull***t. This is in no way descriptive of ubuntu popularity, it's a complete joke. SORRY PEOPLE, BUT WINDOWS 7 HAS RUINED YOUR HOPES AND DREAMS. MICROSOFT WILL NEVER BE BEATEN BY A PENGUIN! !